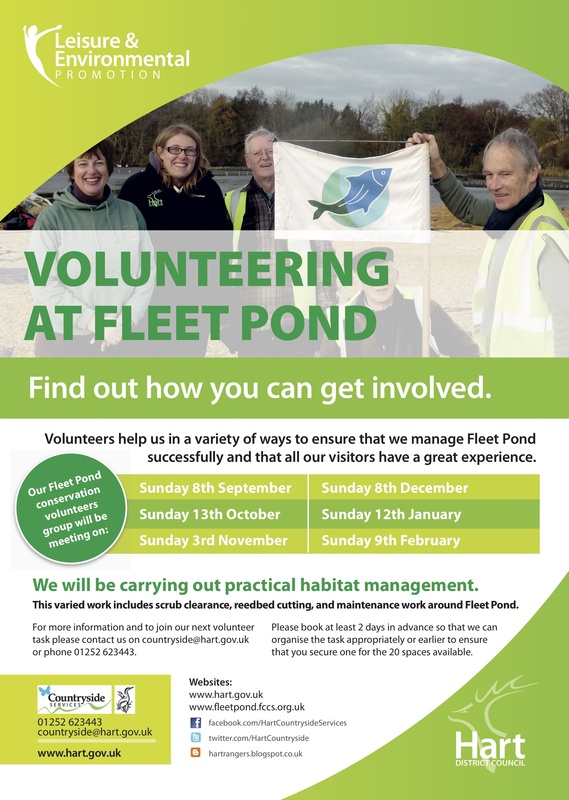 Here’s yet another example of the really useful sort of volunteer work that Fleet Pond Society (FPS) get involved in. The boards on the new and popular dipping platform had a minor defect and needed to be replaced. As you can see from the pictures above and below, everyone got stuck in and the platform is now right as rain. 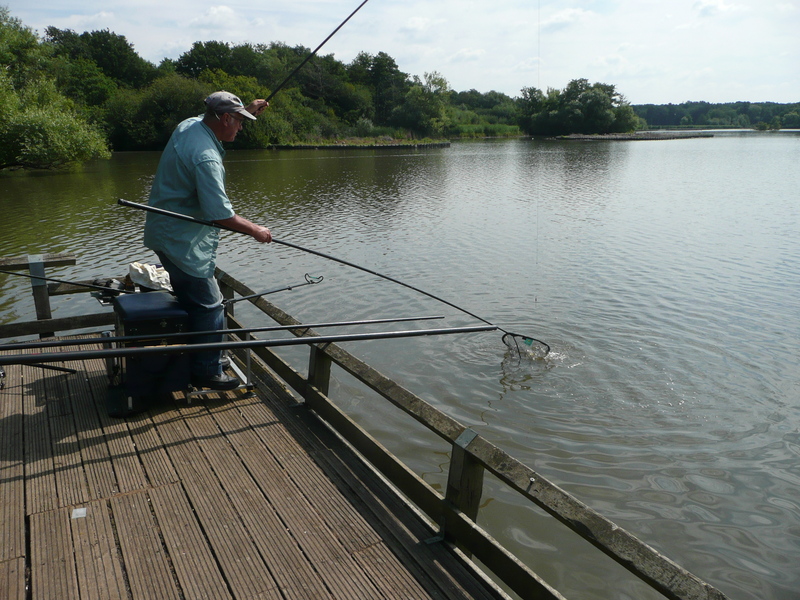 You can read on this blog the enormous variety of tasks that FPS carry out to the benefit of the local community as well as visitors from further afield. If you’d like to support our activities, you can do this by joining FPS (which is from a modest £10 a year), please see here for details. You could also participate in a volunteer event of your choosing, many are held throughout the year and are widely advertised (blog posts, tweets, notice boards etc). We like to think we’re a very sociable bunch and new volunteers are always very welcome! 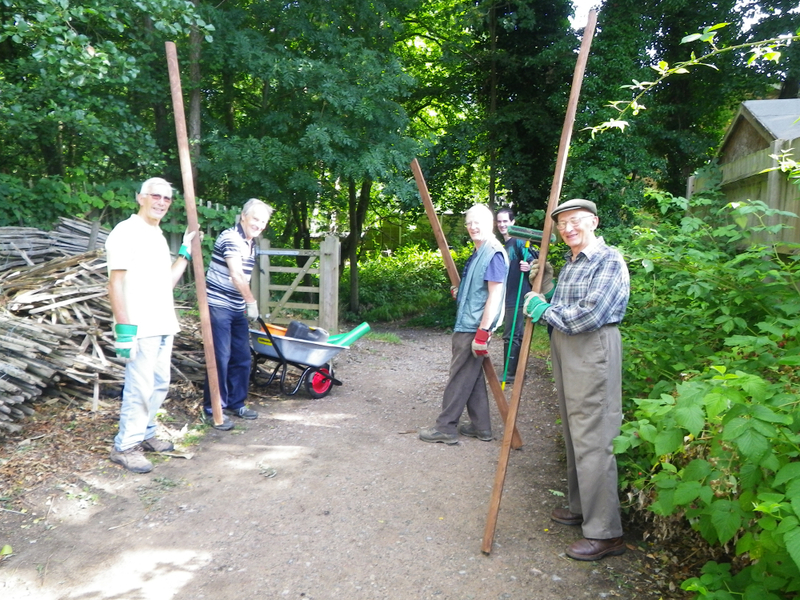 The latest list of Sunday volunteer events can be found in the preceding post (here). You could also suggest that your company has a volunteer event at the pond. It’s very impressive just how much can be done when a group of enthusiastic people get together! Photo credits: top (Rachel Jones) and bottom (David Pottinger). 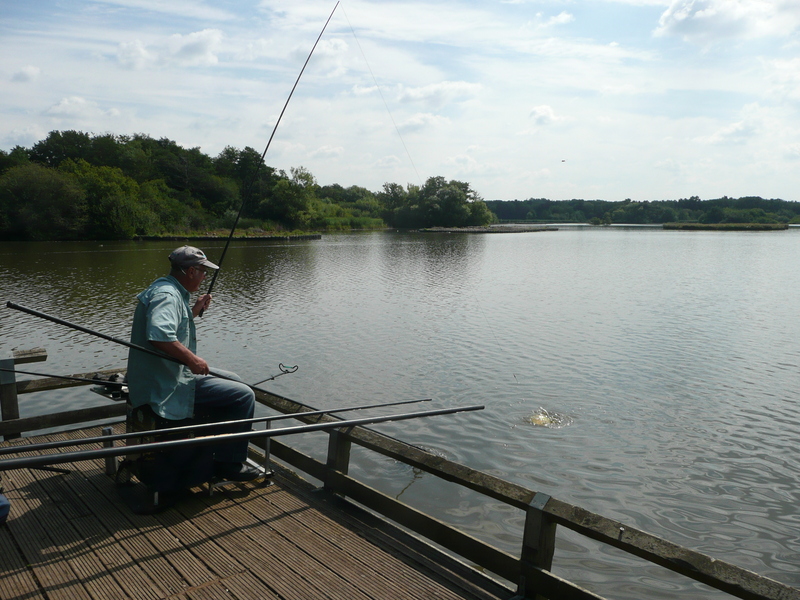 The video above, which gives an overview of Fleet and also mentions Fleet Pond, has recently been put up on YouTube – it’s worth a watch! It’s a promotion by FleetFuture who are developing a Town Plan to guide the future of Fleet Town Centre. The survey is open to all people aged 11 and above, who either live in the area or work within Fleet. The deadline for completing the survey is Monday 16 September. 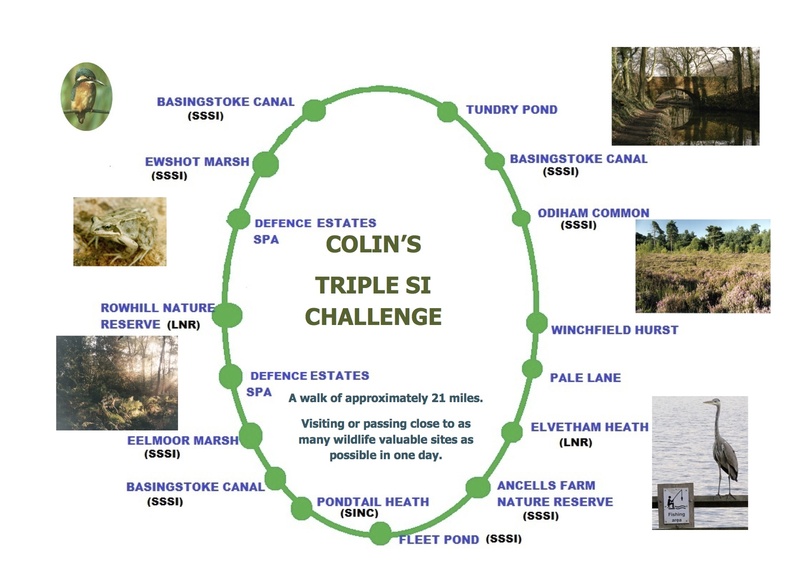 Colin’s Charity Walk – Donations Welcome! 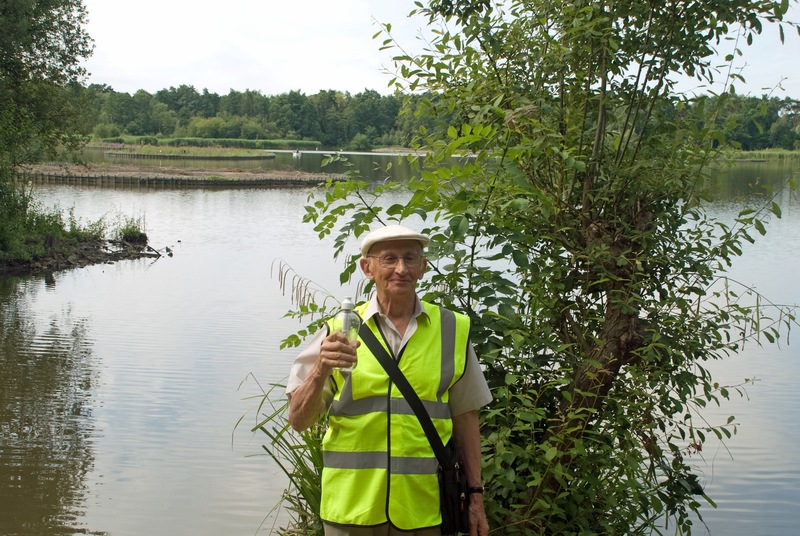 “To support Fleet Pond Society’s Clearwater Campaign towards the restoration of Fleet Pond, I aim to do a circular walk to as many wildlife important sites as possible within one day. The sites will include Sites of Special Scientific Interest, Local Nature Reserves, Sites of Importance for Conservation and Special Protection Areas (a map of the route is given below). The walk is scheduled for Sunday 22 September 2013. To donate, please go the Virgin Money Giving page here. The route map – 21 miles is a long way! Further information on the walk can be found here. This year, chicks have done surprisingly well at the pond. We’re not sure what to put this down to, it could be the addition of the islands creating new habitats, or perhaps some of the predatory mink were scared away by the dredgers. 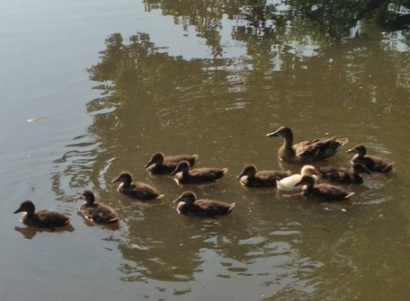 Whatever the reason, our baby ducks, geese, swans, moorhens and coots have thrived. 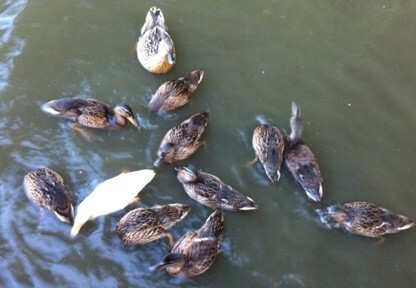 One family of mallards was noticeable as it contained a single white chick amongst the brood of eleven. Blondie, as we have called her (or him) is growing up nicely along with her siblings. The appearance of Blondie led me to go online to research the incidences of ‘mallard mongrels’ and I discovered they’re a fairly common occurrence. 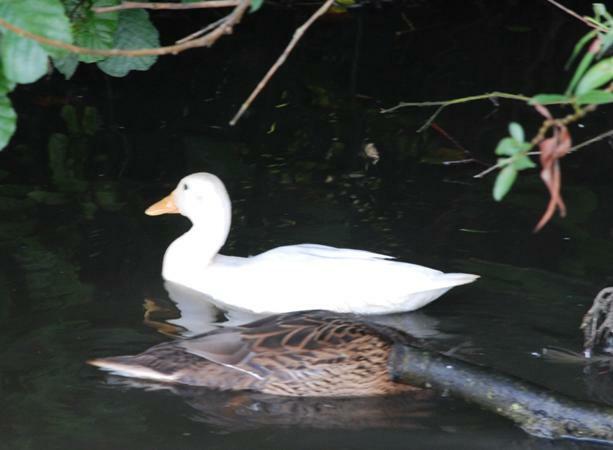 Domestic breeds of duck have bred with wild mallards for years. Many wild birds have the genes of domesticated birds in their ancestry. The rogue gene can suddenly produce a chick with an unusual feature or colouring amongst an otherwise normal brood. I came across the disrespectful terms ‘Manky Mallard’ and ‘Ganky Geese’ to describe this phenomenon. I think this is an insult to the much maligned mallard and got at goose, so I’m renaming these unique birds Marvellous Mallards and Glorious Geese. Blondie is a beautiful duck. Her rogue gene may have come from a Pekin duck, which is a domesticated farm duck, bred for meat and egg production. 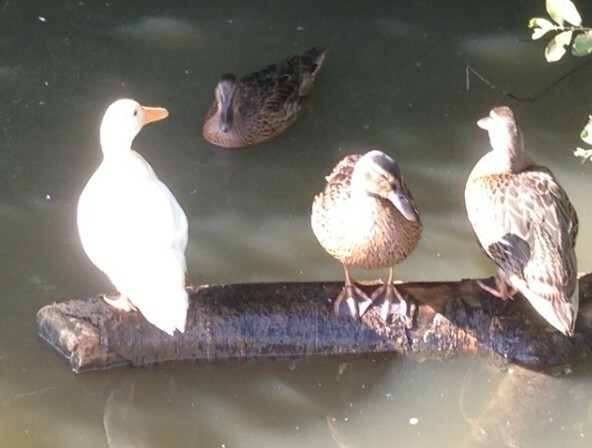 The Pekin is pure white with an orange bill and orange legs. 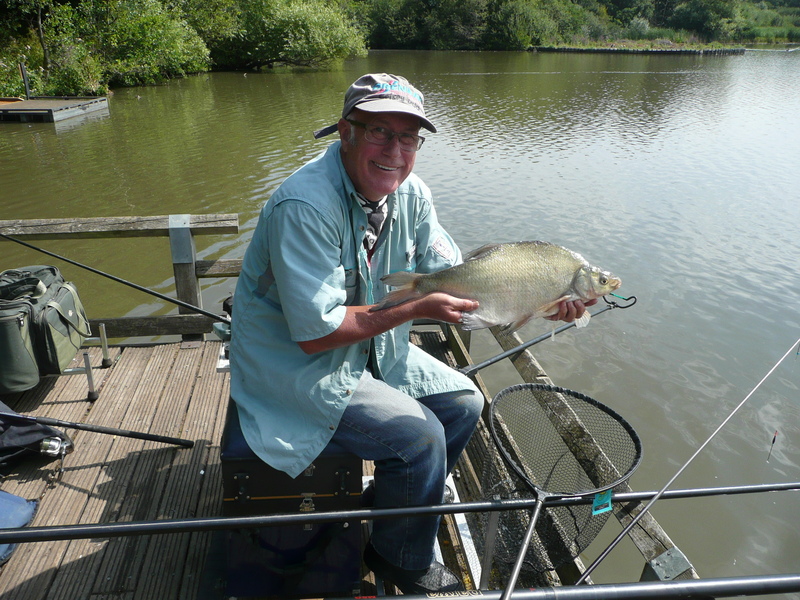 We hope Blondie will grow to full size and one day rear a brood of her own on Fleet Pond. A gallery of Marvellous Mallards can be found here. 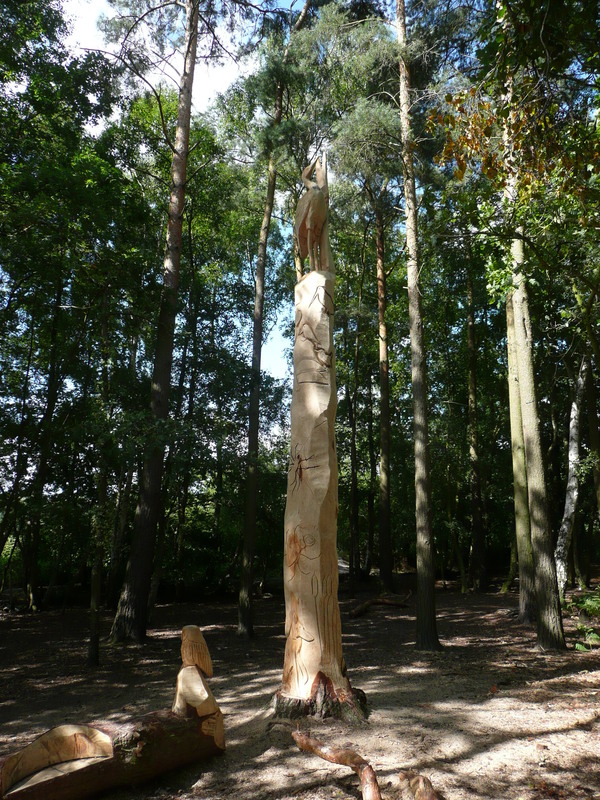 Following on from a recent post on the creative carvings at the picnic area at Fleet Pond, there’s now a totem pole to also take a look at! At the top there’s an impressive looking heron keeping a watchful eye on the Pond (see above and below). 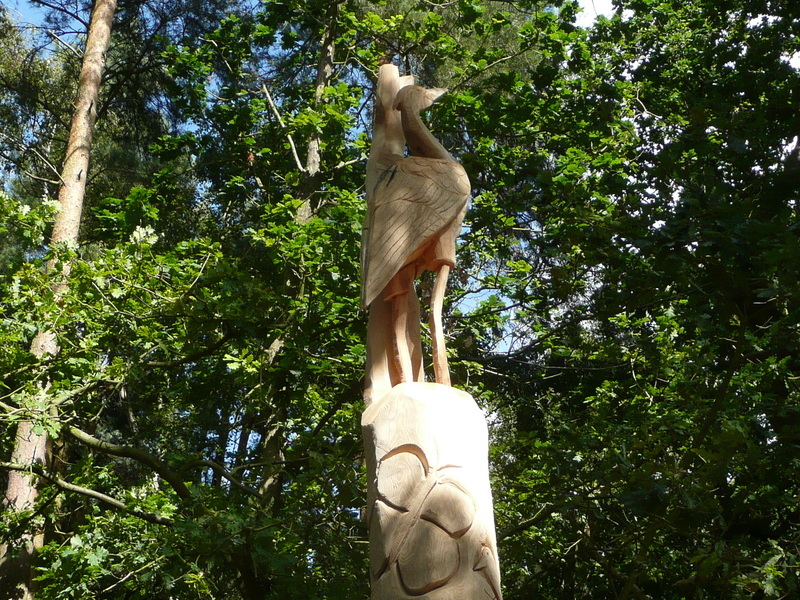 This picture gives an idea of the size of the totem pole. 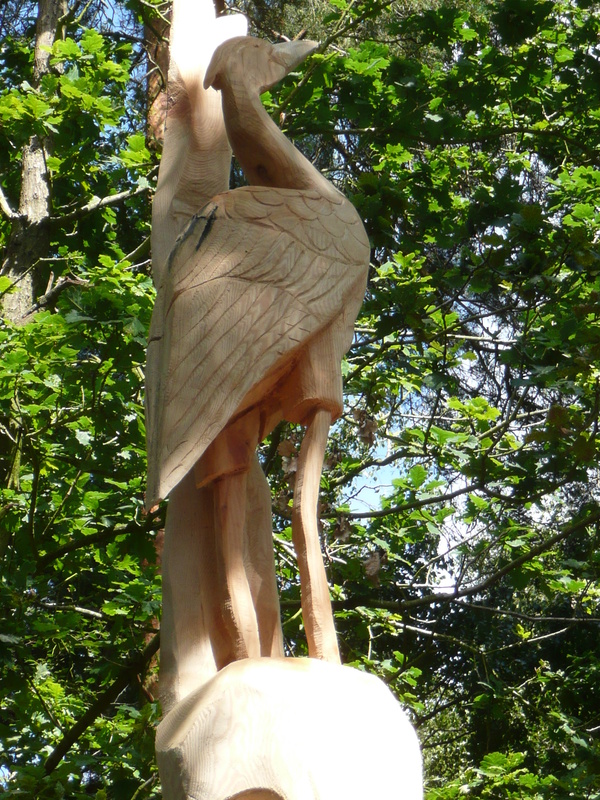 A close-up of the carefully carved heron. Lower down you can see in detail how the carvings have been done. If you’d like to take a stroll round the pond, there are details of three (short, medium and long) walks here. They are all marked by colour-coded posts. 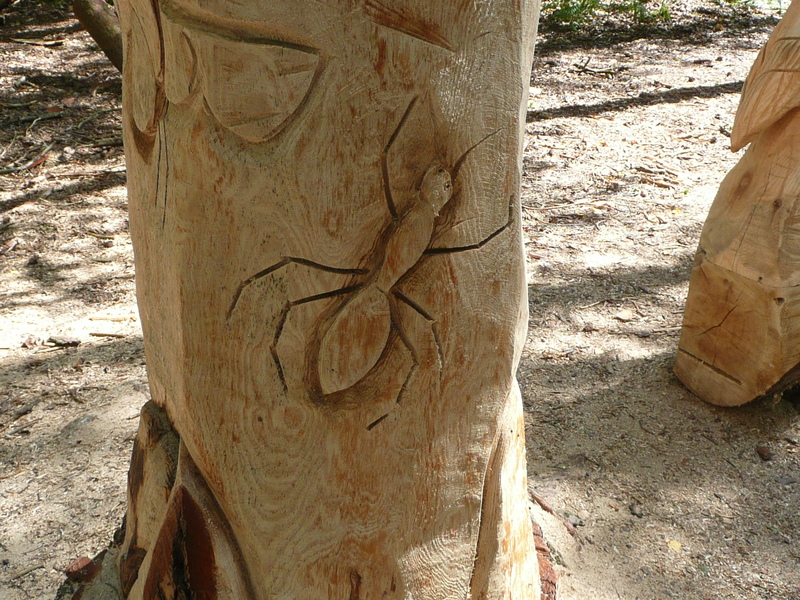 If you’re walking with a buggy, this post may also be helpful. 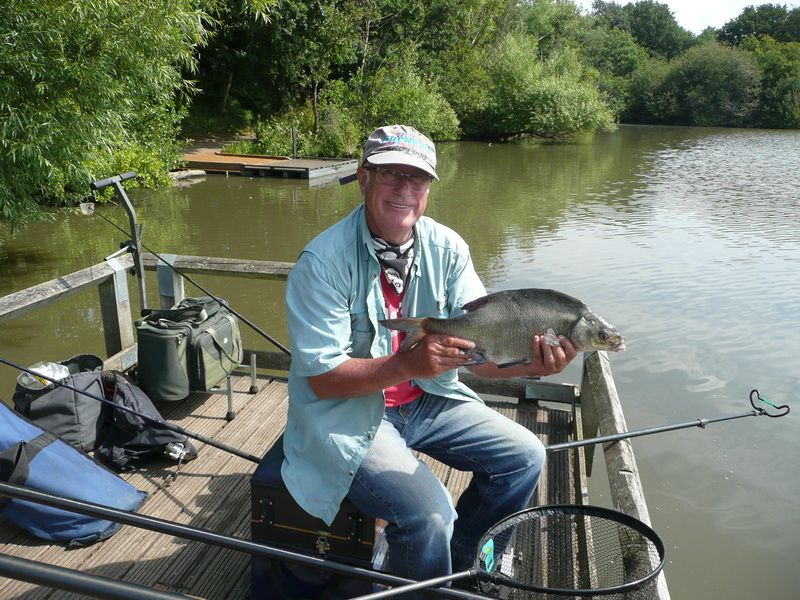 You are currently browsing the Fleet Pond Blog blog archives for August, 2013.